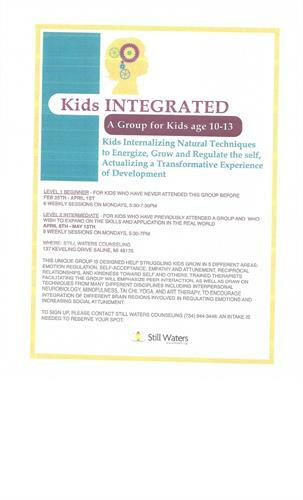 After a successful inaugural presentation, Still waters Counseling is one again holding the Kids INTEGRATED group. Many techniques from from different discplines are to encougage integrating different regions of the brain involved in regulating emotions and increasing social attunement. Intake session is required before attending the group. Intakes can be scheduled by contacting Still Waters Counseling at 734-944-3446.